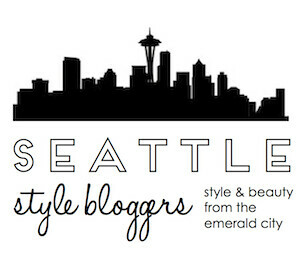 This past month, I had the opportunity to work with two local boutiques here in Seattle. Located in Fremont, Bliss, and her sister boutique, Dream, supply the city with trendy, affordable clothes, accessories, and other fashionable necessities. If that isn't enough to bring you in, well then you must not be interested in clothing at all and are probably on the wrong blog... or you're my dad reading this... I've lost my train of thought. What I was trying to say is that on top of carrying lovely summer dresses and gorgeous jewelry, both stores are staffed by wonderful sales people happy to help you find the perfect piece for any occasion. I spent two afternoons with them, so I have first-hand knowledge of just how lovely they all are! I got to browse both shops (conveniently located across the street from one another) and try on some of their new Spring and Summer styles. My favorite pieces: a beige hi-lo dress, a black convertible purse, handmade gold earrings, and the cutest pair of ankle-strap wedges! Okay, I'll admit it. I've finally been convinced by those hi-lo dresses that are so big right now. This one just called to me. Maybe it's partly to blame on the fact that it's, as my sister-in-law says, "Catie colored"; I blend in with it. Mainly, though, I saw how versatile it could be. It has an elegant and simplistic style, perfect for so many occasions. You could go minimalist, elegant, casual, beachy, whatever you like. The feminine, but not overly girly, neutral shade can be combined with almost any other color or texture your wardrobe may contain. This dress is what I would call a clean canvas, just waiting to be decorated. I thought this dress would be the perfect piece to style in a day-to-night post, but because my photographers, Maria Gunawan and Praisley Jonatan, took so many gorgeous pictures, I decided to break it into two posts. For the day time look, I went for something summery; perfect for walking the pier or one of our local farmers' markets. A sunhat and a oxford shirt protect me from the sun and keep the look casual. Bright necklaces pop against the pale pink dress and a shoulder bag is the easiest way to tote around extra sunscreen and a little spending money. Stay tuned for Look #2! What a beautiful look with the freshness of summer! This is a great look! I've spent a lot of time at their online boutiques in the past! They have great stuff! I've just been doing catch-up on your blog (I feel like I do this a lot, and it makes me feel sort of bad, but I want you to know - I really do read every one of your posts. It's just that I comment on the most recent ones to make sure you see that I've been here!) and I have to start by saying that you must have had the cutest wedding of all time. And how amazing was your grandma's dress? Such a timeless piece, how lucky that she still had it around for you to wear! Love your dress - I need to buy the same one ASAP~! "Catie-colored" haha best description I've heard for a neutral shade. It is a lovely dress; I can see why you were drawn to it. 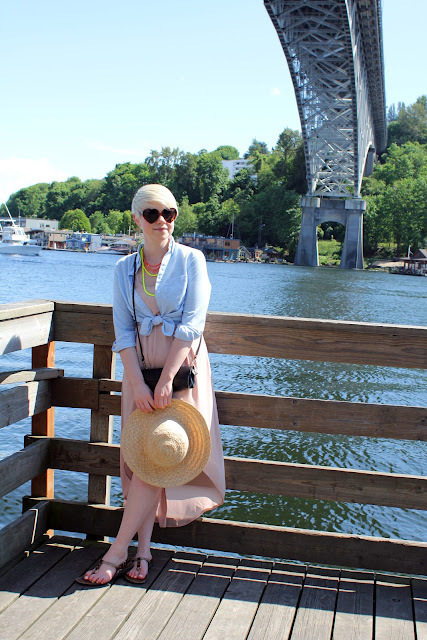 A tied button up over an airy dress is perfect for summer. <3 it!